It’s slightly more difficult to discern the whole epic commotion and grand hubbub surrounding Deerhunter if you haven’t at least taken a listen to their earlier release, Cryptograms. Seriously, you won’t get the buzz, you won’t get the hype, and you most certainly won’t be able to tell your arse from your elbow. But then, I might just be saying this for lack of a better introduction to the “ever-evolving”, “uncompromising” Atlanta collective, Deerhunter. I’ve always remain a skeptic towards their music, but among the throngs of bands that’s been shoved into the battledom of congested hype I’ve always been more than prepared to soak in their brand of noise-rock/shoegaze/experimental/psychedelic artifacts that everyone’s been absolute bonkers about. Also because I’m a complete fool for all things noise-rock/shoegaze, so Deerhunter dudes, you had me at ‘noise’. But for a band that draws regular comparisons to My Bloody Valentine, their latest release Microcastle certainly sounds cleaner amid distortions that feels planned and calculated, thus revealing a compilation that’s somewhat absent from all the “charm in the intimacy of an unpolished production”. 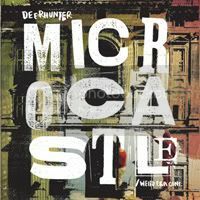 That said, Microcastle is a definite grower and serves as a unique, utterly enthralling listening-- I’d be an idiot to deny that.